Not only is it harmful to the earth to throw recyclable items into landfills, but it's now illegal to dump certain items in many places. When an item isn't accepted by your city's regular recycling pickup, it can be tempting to just chuck it in the trash. Here's how to properly dispose of those tricky items. 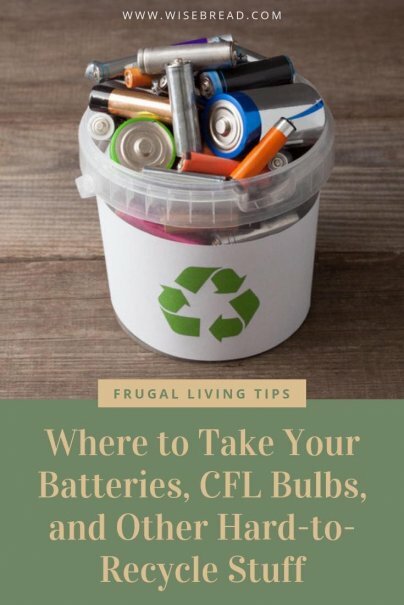 The AAs from your kids' toys, those weird little coin-shaped ones, the 9-volt batteries from your smoke detector, even dead cellphone batteries — none of those should be going to the landfill. Check with your local trash service, because some of them will pick up batteries and dispose of them properly if they're left in a specified place or container. Increasingly, public facilities such as libraries and city halls have battery collection boxes, as well. If you don't know of a location, look up the nearest one on Call2Recycle. The nonprofit says that most of us live within 10 miles of a battery drop-off point. These batteries can't be re-juiced forever, and when they're done, it can be challenging to find someone to take them. But it's even more important to keep these guys out of the landfill than regular batteries, because they contain dangerous heavy metals. You can drop them off at some retailers. Again, check Call2Recycle for locations near you. If you're getting rid of your phone, leave the battery in it and drop it off at a recycling kiosk, public drop-off box, or nonprofit organization. Fortunately, many used smartphones are still worth money, so there are a lot of organizations that will take them. These twisty light bulbs are another dangerous one to chuck in the landfill, because of the mercury they contain. Check out earth911 for locations near you that will take them. Sometimes you can even just drop them at stores like The Home Depot, Lowe's, or Ace Hardware. Jinkies, don't ever throw away an outdated pair of specs! The Lions Club can deliver your castoff glasses to a low-income person in need — and yes, they sort them for prescription first so they can match the eyewear to the need. Many optometrist offices have Lions Club collection boxes, but if you can't find one, you can contact your local club or mail them in. Goodwill accepts donations of working electronics at their stores, or they can pick them up. They will even wipe your personal data off your hard drive for free. Specifically, Goodwill accepts desktop and laptop computers, tablets, business network switches and routers, and servers, all five years old or less. Any older electronics will have to go to an e-waste collector. Picture tubes contain lead, so this is another product that it's extra-important to keep out of landfills. One thing Goodwill will not accept is a bulky, old-style monitor. Drop them off at Staples for free. Or drop off up to two computer monitors of any kind, per day, at Best Buy, but you will have to pay them $25 to take them off your hands. You can also contact the company that made the monitor to find out if they have a take-back or trade-in program. Smaller TVs can be dropped off at electronics stores. If you have a large TV to get rid of, you'll have to contact an e-waste company such as All Green, and they can either come pick it up for a fee, or allow you to drop it off. You could also try contacting your local government, since many have e-waste drop-off centers or schedule e-waste collection days that include TVs. Good news here: You can actually get money or store credit for ink cartridges from office supply stores or online buyback programs. Call your local office supply store. Because they contain metal that can be sold as scrap, unwanted appliances are usually easy to get rid of — you might even get paid for them. My electric utility paid me $35 for the privilege of picking up my old freezer. Retailers will often take away an old appliance for free when delivering a new one. But when my dryer broke, Sears Outlet wanted to charge me to remove it. I asked around and get the number for a local independent scrap dealer, who was at my house with a dolly to haul it away within an hour. Contact your town, city, or county to find out the procedure for disposing of Household Hazardous Waste. Los Angeles county, for instance, hosts regular HHW collection events. The county reuses discarded paint for covering graffiti, and converts used motor oil into marine diesel fuel. According to the Food and Drug Administration, you should contact your waste collection service or your local government to find out if there is a medication take-back program in your area. If you can't get them to such a program, the FDA suggests you mix old pills with an undesirable substance such as kitty litter, seal it in a plastic bag, and throw it in the trash. 1-800-GOT-JUNK? and similar companies will pick up an appliance, an old hot tub, tires, construction waste, TVs — anything not considered hazardous. They promise to dispose of it responsibly. Of course, this kind of ease comes at a price, about $500 a truckload, on average. You never know what trash of yours could be another person's treasure. I've had success getting members of my community to take away empty glass bottles, old magazines, unwanted furniture, and broken electronics, all by listing them on my local Freecycle group.